White paper on crime 2001 Part 1/Chap.2/Sec.2/1. Fig. 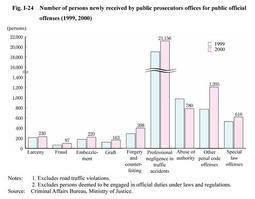 I-24 shows the number of persons received by public prosecutors offices for public official offenses in 1999 and 2000, by type of offense. The total number received in 2000 increased by 2,735 (12.4%) to 24,865 from the previous year. By type of offense, professional negligence in traffic accidents accounted for an overwhelming majority (85.1% of the total), followed by abuse of authority, forgery and counterfeiting, and larceny, in that order, excluding "other penal code offenses" and "special law offenses". 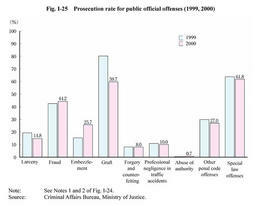 The number of persons prosecuted for public official offenses in 2000 increased by 277 (9.9%) from the previous year to 3,068. 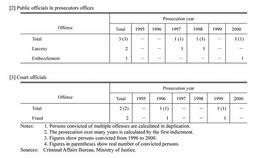 The prosecution rate fell 0.3 points from the previous year to 12.4%. Fig. 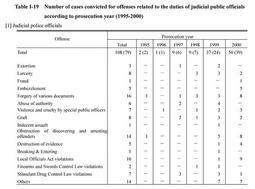 I-25 shows the prosecution rate for public official offenses in 1999 and 2000, by type of offense.